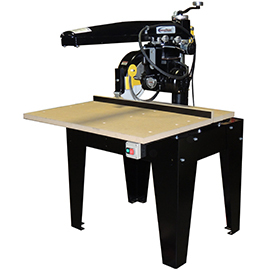 Original Saw Woodworking Machinery and Equipment from Rudolf Bass Inc.
as well as dado operations and can cut off wood that is up to 8" thick. 16" Heavy Duty Series Our Heavy Duty Series wood cutting saws are the best in the industry. Featuring 3 and 5 horsepower motors. 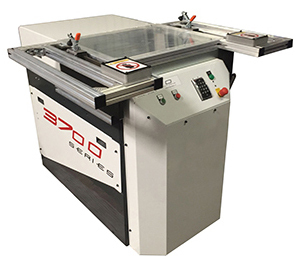 The 3700 Series Cross Cut saws were developed to safely and effectively cross cut wood, wood products, composites and plastics. This series differentiates itself from other machines because the blade is visible only when the handle is pulled or the machine's semi-automatic cycle is activated. The cutting is done safely inside a cutting box where the sawdust is pulled back into the machine and removed through the dust port on the back side of the frame. The semiautomatic machines (models 3710.S, 3715.S, 3720.S, 3725.S) use a smooth running belt-drive system. The system is powered by a reliable DC motor, which is controlled by our time tested drive units. During the cutting process, the desired material is clamped either manually or pneumatically and the cutting head is controlled by the push of a button. On these models, the carriage stroke is varied by the adjustable stops on the right side of the machine. This time saving feature reduces waiting by ensuring that the blade doesn't travel farther than needed to cut the desired length. Our Beam Saw series is constructed of cast iron, cast aluminum, machined structural box tubing beam and heavy welded 'U' channel frame. It is capable of cutoff lengths of up to 65" and up to 6.25" deep. The hardened and ground, smooth replaceable track rails and our time tested motors will produce many years of trouble free service, and are capable of a variety of cut off and dado operations. 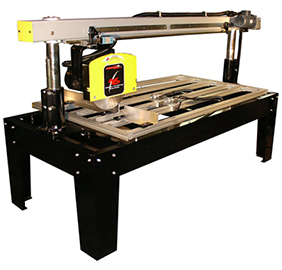 This machine, coupled with our new release power carriage feed accessories, make the machine a semi-automatic platform capable of a wide variety of production cutting operations. We can help you obtain new machinery from Original Saw just ask us!